The fourteen angels, as it turns out, are a group of collectively venerated saints in Roman Catholicism (news to this lifelong Catholic, but then again, I’m not a very good Catholic). Their intercession is believed to be particularly effective, especially against certain diseases. I love the image of them protecting children. I especially love the following image, which hit me with a jolt when I saw it the other day. I KNOW I saw a copy of this, many times, as a young child, but the where/when eludes me even as it haunts me. It’s so touching; it fills me with warmth and comfort, as if an angel were watching not just over those lost children, but over me, and over the lost child in all of us. Precisely the feeling I get when listening to this music. Another recent surprise was discovering that this song is a longtime Advent favorite for many. I’m going to guess it’s more a European (particularly German?) thing than American. 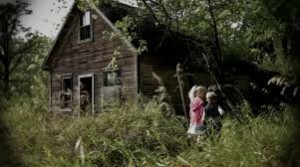 Although the second version of it, below, seems to be geared more toward an American audience, the sort of thing you might find on PBS holiday specials or pledge drive weeks. Not to mention that Kathleen Battle’s red evening dress has the most comically extravagant (read: goofy) sleeves I’ve ever seen on a classical music stage. (Not to be confused with Yuja Wang’s equally eyebrow-raising Little Red Dress. 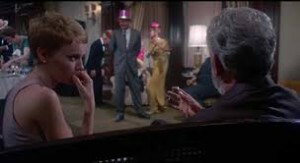 http://wp.me/p3k7ov-iU) But Battle’s voice is so beautiful, as is Frederika von Stade’s, that it trumps the dress choice. Now, for some quirky American reason, they have the women sing the duet twice, same words and all. Probably because the song alone, minus “Traumpantomime” is less than two minutes. So, what the hell. It sounds equally beautiful both times. And as I tend to listen to beloved songs over and over, it allowed me to click on “replay” less times. This week in the U.S., Thanksgiving commences the holiday season. I guess it’s close enough to Advent to call this a holiday offering to my readers. So, enjoy, dear readers. And if you’re curious to hear the piece performed in English (featuring David Wigram, boy soprano) well, here you go: https://www.youtube.com/watch?v=zg9NBMR4sT8 It’s got a lovely slideshow, to boot. This entry was posted in Classical Music, Life and tagged Abendsegen, Adelheid Wette, Classical music for the holidays, David Wigram soprano, Elisabeth Kulman, Engelbert Humperdinck, Evening song, Frederica von Stade, German Advent song, Hansel & Gretel opera, Hansel and Gretel, Juliane Banse, Kathleen Battle, Song about fourteen angels, the Children's Prayer on November 25, 2014 by admin. 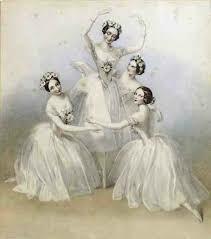 Back in the late 18th century, the ballet world decided that female dancers should look ethereal, sylph-like, as if they could fly. A theater man named Charles Didelot came up with a flying mechanism, via harness and pulleys, that allowed dancers to rise to their toes before becoming wholly airborne, wafting across the stage like a spirit. Audiences at it up. Choreographers factored the philosophy of it into their work, even though no shoe existed to help the female rise to that tippy-top place. But in 1831, prima ballerina Marie Taglioni simply made it happen, for her lead role in La Sylphide. And not just one moment, one scene, but for the whole ballet. Which must have hurt like hell. Not to mention she had to have had very, very strong feet. She’d fortified her satin slippers with leather soles, darned the sides and toes to create a bit of a box at the toe base, and stuffed the tips with a little cushion. And so it began. Marie Taglioni, Pierina Legnati, Anna Pavlova: these pointe shoe pioneers steered us in the direction of the shoe that ballet dancers wear to this day. But you didn’t come here for a history lesson, did you? You want odd facts. 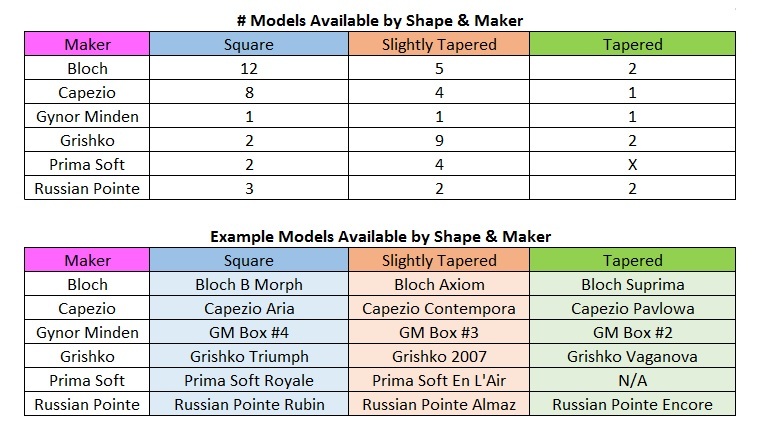 So, here you go. 1) They hurt the feet (in case the above graphic didn’t aptly drive that point in for you). You’re probably thinking, no, no, the professional dancers I’ve seen look so relaxed and smiling. The shoes probably feel as comfortable and relaxing as bunny slippers by the time a dancer turns professional. Um, not. 2) They are handmade, and it’s very cool to watch one being made. The box of the shoe is composed of many layers of burlap, or buckram felt, all slathered with with a pasty glue. A picture here is worth a thousand words; check out the video below. 3) They are the prettiest thing in the world when you take them out of the box, but utterly unsafe and painful to dance on, in that condition. 4) They are expensive, averaging $75 a pair. 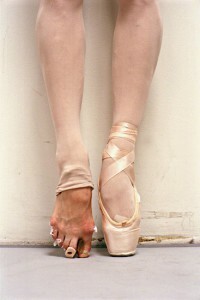 Professional ballet companies provide pointe shoes for their dancers (80 pairs a year on average, which depends wholly on the company’s financial status and budget for such a thing. Some companies can only offer 20 pairs per dancer, while others offer 120). 5) They are noisier than you can imagine until you break them in. Even then, they can sound like tap shoes on a stage. The dancer must spend years training, learning how to land in a way that softens the sound, using the toes first and rolling down through the full foot. Quiet landings are an art in and of themselves. 6) Dancers break their new pointe shoes down in a rather violent way, including hammering the boxes, slamming them against walls, stepping on them, shutting a door on them, breaking the shanks, slashing the soles, then, ironically, pouring in glue or floor wax to toughen them up. Understand, though, that they only apply glue/floor wax to the spot where toe meets the ground (the first spot that goes and HURTS when it’s soft). Remember that video I promised? This is THE coolest video on pointe shoe making, and un-making, created and presented by the Dutch National Ballet. 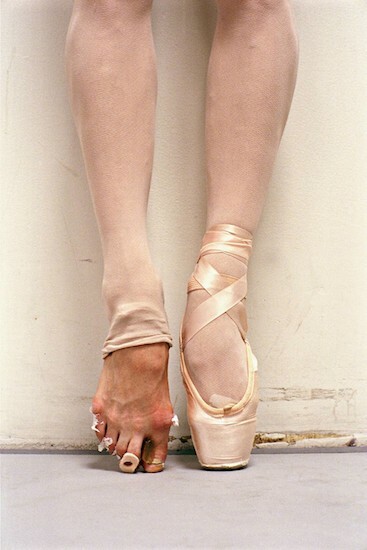 In the course of two minutes, you see both the maker crafting the shoe and the ballerina breaking the shoe in. Way cool. 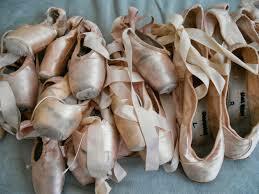 7) Pointe shoes have a very short shelf life. One night of performing, or even half a night if your role is demanding. Sometimes professionals will sew themselves into their shoes (like, into the tights). Or sew stitches in the knot to tack the endings so they don’t come out mid-performance, little flapping inch-long bits of pink satin. Because, by night’s end, the shoes are dead. 8) There’s no left and right shoe. You get to pick (but not switch them around, thereafter). A neat trick, if, like me, one of your feet is slightly larger than the other: you can buy two pairs and divide them up to form two pairs with mismatched sizes that suits your foot. 9) They never have ribbons sewn on when you buy them. You do the work, which allows you to customize precisely where the ribbon will fall. Most dancers will incorporate some elastic into the equation, as well. 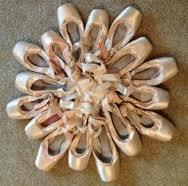 The amount of time professional ballet dancers spend on sewing ribbons and elastic to pointe shoes is a lot. 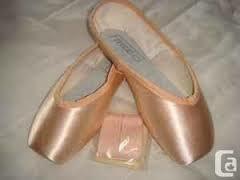 10) There are twenty-one manufacturers producing pointe shoes these days, and within each manufacturer, there are varieties, usually having to do with the shape of the box. Which means there are over 100 choices to try in finding That Perfect Fit. 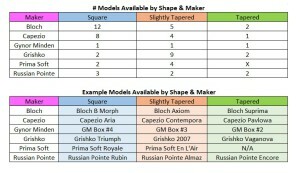 Here’s a nifty chart, taken from the site, pointeperfect.com, which also has a great article if you’d like to read more on the subject (http://pointeperfect.com/pointe-shoe-reviews/). 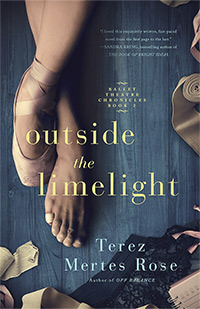 PPS: Like reading fiction about ballet dancers, their shoes/feet/lives/loves/sorrows and the ballet world behind the scenes? Check out Off Balance HERE and Outside the Limelight, A Kirkus Indie Books of the Month Selection HERE. 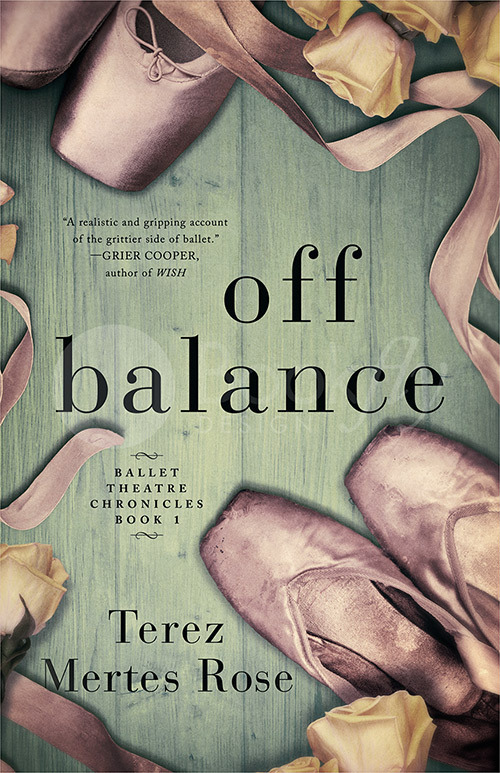 Both part of the Ballet Theatre Chronicles. This entry was posted in 10 Things, Ballet and tagged Anna Pavlova, Are pointe shoes handmade, Dutch National Ballet video on pointe shoes, Freed of London, fun facts about ballet, fun facts about ballet dancers, Fun facts about pointe shoes, How long do pointe shoes last, How many pointe shoe manufacturers are there, How much do pointe shoes cost, La Sulphide first ballet en pointe, Marie Taglioni, Pointe shoes, Pointe Til You Drop, Pointeperfect.com, Straight to the Pointe, unusual facts about pointe shoes, What are pointe shoes made of on November 17, 2014 by admin. Back in 2007, when I wrote this for my blog at Violinist.com, I would have frequent, disturbing, “new violin owner/player” dreams. Now that my practice is no longer in its infancy, the dreams have faded. I suppose it’s like having a new baby in the house, compared to a teenager (different nightmares now — including waking ones). I was also writing a lot more fiction at the time I penned this. Fun to read, now. Allow me to share. I am in a room with my violin. Outside it is growing dark, a curious purplish haze. I pick up my violin to practice and discover, to my horror, that the bridge has fallen. As I fumble to upright it, the violin neck snaps. I stand there holding the body, neck now dangling limply, connected only by the strings like a demented marionette, and I begin to tremble. I live in the mountains, forty minutes from the nearest violin shop. It’s a Friday and my lesson is on Tuesday. What will I do? What will I do? An insistent beeping noise commences as red lights begin to flash. A warning, then, that the violin will not make it. I clutch the violin tighter and the seams crumble beneath my hands. Now I am left with planks of wood and dangling strings. That’s it. I have lost my violin. The warning bell continues to shriek. Why won’t someone turn it off? Reality finally permeates my consciousness. My eyes fly open, my hand shoots out and fumbles for the alarm clock. Finding the snooze button, I stab it and lie back down, heart hammering, mind racing. A dream. Just a dream. Thank God. When I get out of bed ten minutes later, I peer into the violin case, just to confirm that the intensity of the dream didn’t somehow affect the violin. It’s fine, snuggled beneath its soft blanket, scroll peeping out like a baby doll’s head. I pull the violin out and hold it for a moment, breathing my relief in and out, in and out. And so it goes. 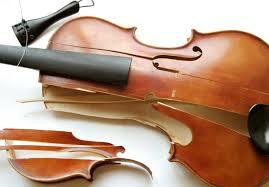 Yet another broken violin dream. He is tall and dark-haired, with shaggy, vaguely menacing features. He looks at me now, his face carefully inscrutable. “I don’t know what you’re talking about,” he says. He has taken my violin. I can see it in his eyes. I cast a glance all around me. I see polite but blank faces. Carefully blank faces. Like in Rosemary’s Baby. It’s a conspiracy, then. They’ve stolen my violin. They’re going to lie about it. My breath comes faster, in choked little gasps. “Give me back my violin!” My voice has risen to a shriek. My violin is in great danger. I have no idea where it is. I race around the room, panicked now, knowing it is somewhere, terrified that I just might have seen the last of my precious baby. “Shhhh.” A pat on my back jerks me out of my nightmare. It is 2am and my strangled cries and convulsive jerks have awakened my husband, who pats me a few times more and then falls back asleep. I, however, have no desire to return to the world of my dreams. I’ll tell my husband about my dream the next day. He’ll chuckle and shake his head. For him, dreams are vague oddities that you mull over for a few minutes and then never give a second thought to. Not me. My dreams are visceral, disturbing, larger than life. Both these dreams seemed so real, so threatening, that months later, they still make something inside me seize up, run to go check my violin to confirm it is safe and intact. 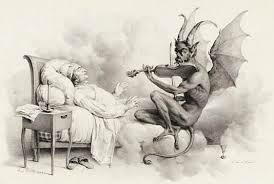 This entry was posted in Life, The Violin and tagged broken violin, stories about violins, violin dreams, violin nightmares, Violinist.com on November 9, 2014 by admin.